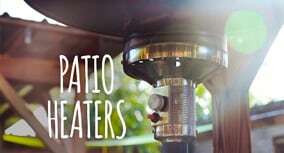 ✔ Let Our Experts Find The Right Patio Heater For You! Included dual stack control lets you control each element independently - $90 value! Keep your outdoor dining, seating, or waiting areas open longer during colder weather by investing in Commercial Patio Heaters. Whether you have a bistro, café, restaurant, patio, club, resort, or any other type of commercial or hospitality area, you don’t have to close your outdoor area when the temperature drops. The cooler, brisk months can still be enjoyed outside with a commercial patio heater. Let BBQGuys help you stay open longer with an effective outdoor heating solution. All commercial patio heaters undergo meticulous testing to meet the demands of outdoor commercial space. These outdoor patio heaters will have higher BTUs as well as an extensive list of safety features such as a tip-over kill switch, safety tilt, automatic shut-off valves, and oxygen depletion sensors – all of which are requirements for commercial use. There are a few different types of commercial patio heaters to choose from. Electric Heaters offer environmental benefits with zero emission. Commercial Infrared patio heaters warm people and objects instead of the air and provide a better radiant efficiency than traditional heaters. Propane fueled commercial outdoor heaters offer the most versatility since they can be easily transported and moved. Propane units are usually built with caster wheels on a sturdy carrier, which also serves as the propane tank housing. BBQGuys offers a wide-range of outdoor commercial grade patio heaters from the industry’s leading manufacturers. Our outdoor commercial heaters are available in three different fuel types: natural gas, propane, or electric. Most patio heaters deliver infrared heat. Most commercial grade patio heaters are made of durable, industrial strength stainless steel to endure outdoor conditions year-round. These weatherproof and water-resistant units are sleek, well crafted, and streamlined to complement any outdoor space. In many cases they can be installed in coordination with your existing structure. Wall/ceiling mount, post, and freestanding/portable commercial outdoor heaters range from small and discrete heaters to large-scale and multiple-unit installations. All of our commercial outdoor heaters provide state-of-the-art technology that’s both aesthetically pleasing and functional to the outdoor space. BBQGuys offers a broad variety of commercial patio heaters from top brands including Infratech, Solaira, Bromic Heating, and many more. Our experts can assist you with determining patio heaters that best fit your outdoor space. We can help you with every aspect from controls, colors and mounting options for our energy-efficient and eco-friendly heaters. Call us at 877-743-2269 or chat with us online to discover the best outdoor heating solutions for your space.